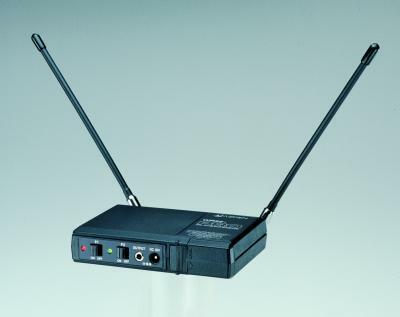 A VHF "discrete" non-diversity receiver the WR22-PRO allows you to use two wireless microphones simultaneously - one on each channel of a stereo camera. Unlike the <?xml:namespace prefix = st1 ns = "urn:schemas-microsoft-com:office:smarttags" />WDR-PRO each receiver inside the case is set to a different frequency allowing you to record the sound from 2 microphones at the same time. On-board controls allow you the videographer to monitor the signals being received and to stop receiving from either microphone if you wish. All receivers and transmitters in the "PRO" Series are on the same 2 frequencies (169.445MHz and 170.245MHz).